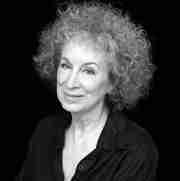 Comprehensive information about Margaret Atwood including biographical information, facts, literary works, and more. Margaret Eleanor Atwood, CC, O.Ont, FRSC is a Canadian poet, novelist, literary critic, essayist, and environmental activist. While she is best known for her work as a novelist, she is also a poet, having published 15 books of poetry to date. Many of her poems have been inspired by myths and fairy tales, which have been interests of hers from an early age. Atwood has published short stories in Tamarack Review, Alphabet, Harper's, CBC Anthology, Ms., Saturday Night, and many other magazines. She has also published four collections of stories and three collections of unclassifiable short prose works.. poet novelist essayist This educational Margaret Atwood resource has information about the author's life, works, quotations, articles and essays, and more. Articles about Margaret Atwood or articles that mention Margaret Atwood. Here are a few random quotes by Margaret Atwood.